I chanced upon this granola recipe from the New York Times; it is originally an Eleven Madison Park recipe. Apparently, after the end of a meal, all diners are gifted a jar of this signature granola to take home. The reviews on the NYT were stellar, and I was intrigued. I will say that I’ve made a few granola recipes in my lifetime, and this one is the best of them all. It has the perfect balance of sweet and salty with the coarse salt and maple syrup. Coarse salt is so important here, because you get little bursts of savoriness between bites and it’s just delightful. The bake is on point – no soggy clumps, just crisp toasted oats accompanied by buttery shreds of toasted coconut and nutty pecan pieces. I’ve since made two batches of this recipe, and had it on a near daily basis with Greek yogurt for a healthy snack. I did make some substitutions from the original NYT recipe to make it a little more healthful and more to my tastes, which I’ll share in the recipe below. Note: I generally prefer using weight measurements, which I’ve provided below. Preheat oven to 300. In a large bowl, mix together the oats, pecans, and salt. Line a large rimmed baking sheet with parchment paper or a silicone baking mat, and spread granola over it. Bake for 30 to 35 minutes, stirring granola a few times along the way. Stir in coconut to granola and bake for another 5 minutes. You want to see the granola looking dry and lightly golden. 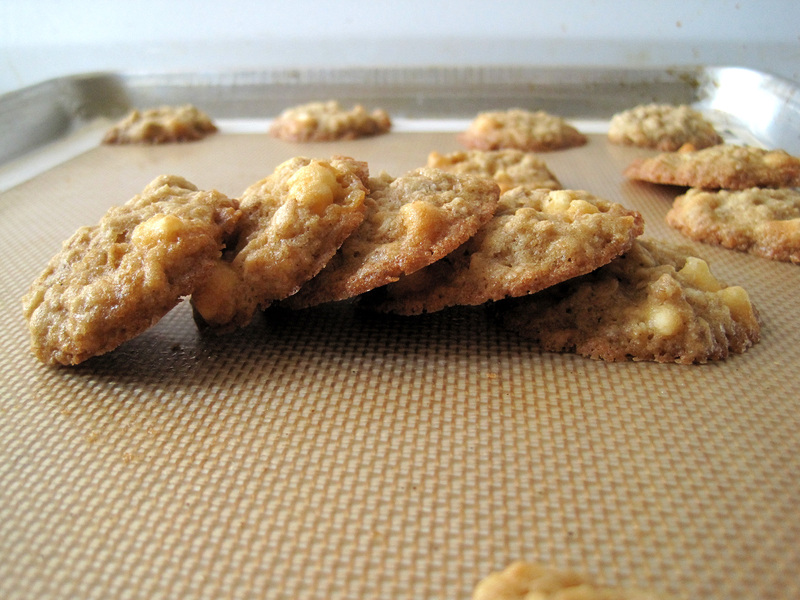 This is the third oatmeal cranberry white chocolate cookie recipe I’ve posted on my blog, the others being Cooks’ Illustrated and Serious Eats, and I think this one is one of the more successful ones. (Got my coworkers’ stamp of approval!) I usually have little faith in corporate recipes and I don’t believe them to be as rigorously tested as other baking blogs, but I decided to give this one a shot because it had a surprisingly low sugar-to-cookie ratio and it also looked really easy. And it turned out great! I loved that it wasn’t too sweet, and it felt almost healthful in certain bites. I feel like most cookie recipes tend to be overly sweet, and I usually have no problems reducing sugar by 1/4 cup or so to no ill effect. The other perk of this recipe is that it bakes at a slightly higher temperature of 375F than the standard 350F, so it didn’t spread out too much, had a crisp edge but still retained a chewy center. Since it is an Ocean Spray recipe, I found that the 5 oz portion of cranberries that was listed was excessive and I only used about 3 oz, or until the cookie dough looked sufficiently studded with cranberries. As my foray into gluten-free baking continues, I have been pushing the boundaries slowly. I’m not going to be making gluten-free bread or cake anytime soon – basically anything that contains flour as its main component will be tricky to perfect with gluten-free flours. 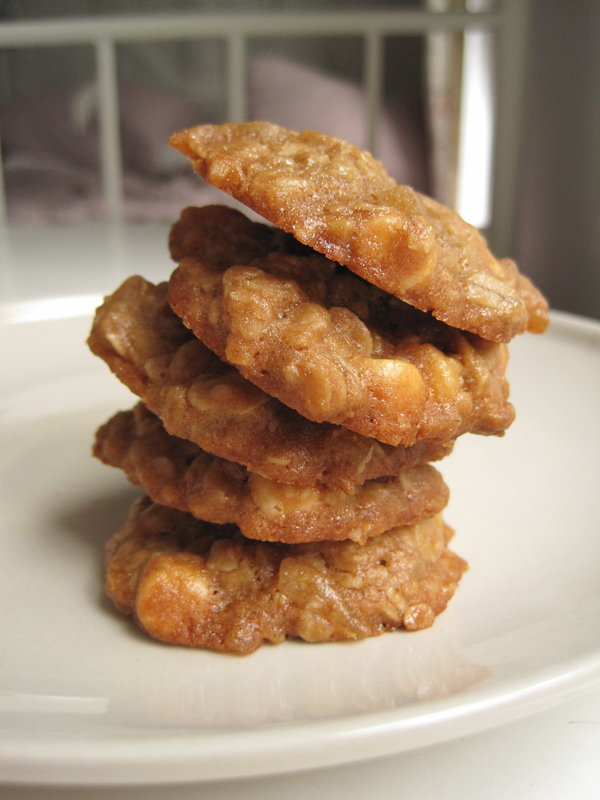 I thought that an oatmeal cookie would be a decent compromise, since the oats take up considerable bulk in the cookie. 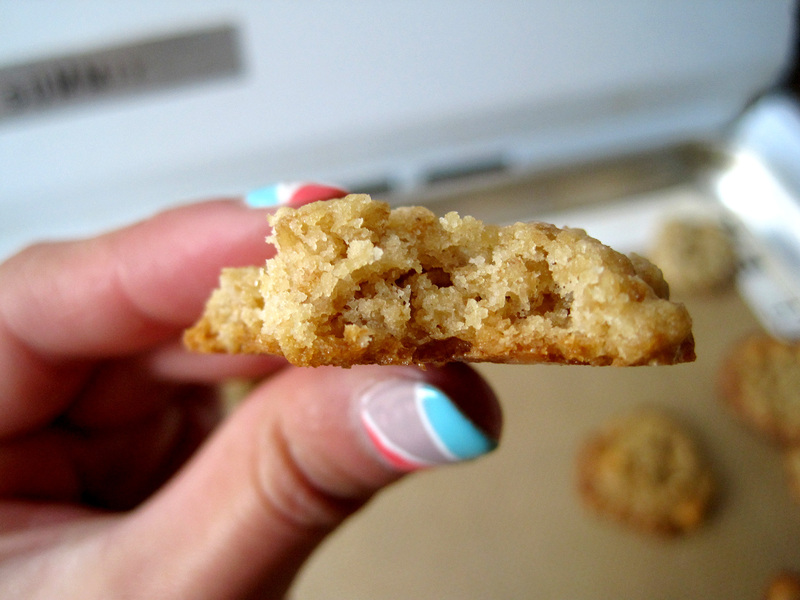 I took a popular oatmeal cookie from Allrecipes and used a homemade gluten-free flour blend from the Celiac Support Organization website, specifically Carol Fenster’s General Baking Mix #1. I picked that recipe for its simplicity, and because I already had tapoica starch lying around. Then came the actual baking. These cookies are actually my second attempt. My first attempt came out overly spread out and lacy, and all the cookies merged into a giant lattice of baked cookie dough. It was still tasty, but it was more of a crisp and thin variety than soft and thick. Gluten-free flours without any additives generally don’t create structurally sound baked goods because the gluten protein provides a great deal of stability to a finished product. My hack was to then freeze the cookies so that they are less inclined to spread out. I then freezed the dough after shaping it into balls, and baked it at a higher temperature at a shorter duration. 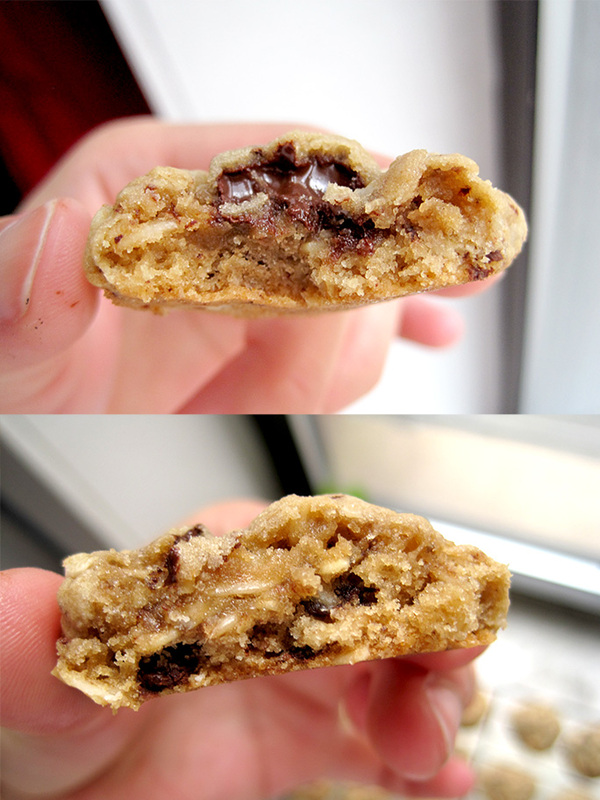 That worked wonderfully, and gave me cookies with a soft, almost cakey texture with a crisp caramelized rim. 1. In a medium bowl, cream together butter, white sugar, and brown sugar. Beat in egg, then stir in vanilla. Combine flour, baking soda and salt; stir into the creamed mixture. Mix in oats. Roll the dough into teaspoon sized balls, and freeze till hard. 2. Preheat the oven to 375 degrees F (190 degrees C). Grease cookie sheets. Place cookie balls 1 inch apart on cookie sheets. 3. Bake for 8 to 10 minutes in preheated oven. Allow cookies to cool on baking sheet until completely cool. Blend all flours till combined. These flours are very light, so take care to avoid coating your counter in white powder. Potato starch is also different from potato flour – be cautious in your purchase. One of my favorite snacks these days is Trader Joe’s Chocolate Almond Granola. 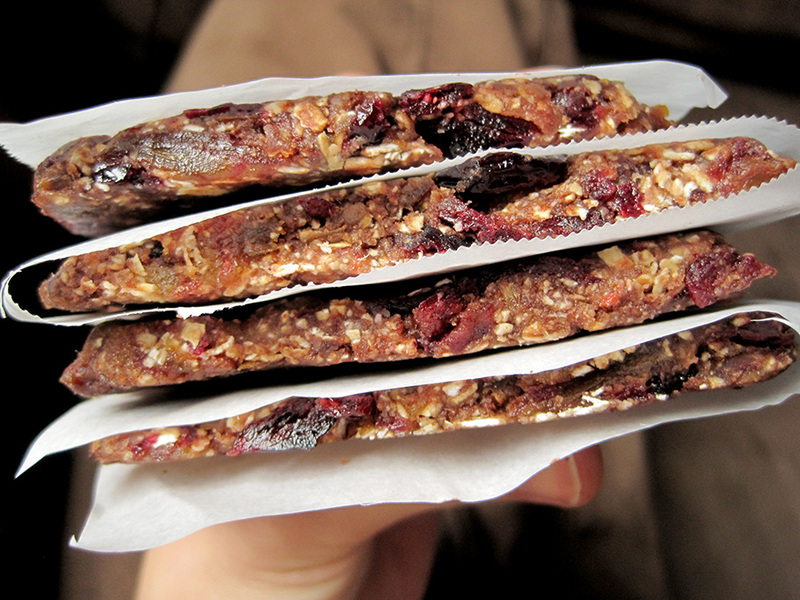 It’s chocolatey, it’s crunchy, it satisfies my breakfast and mid-afternoon snacking needs – it’s really a great product. What’s even better about it is how simple the ingredients list is. Just about everything can be found in the grocery store, and I decided that instead of buying this cereal over and over again, I’m just going to make it. It’s too simple not to. 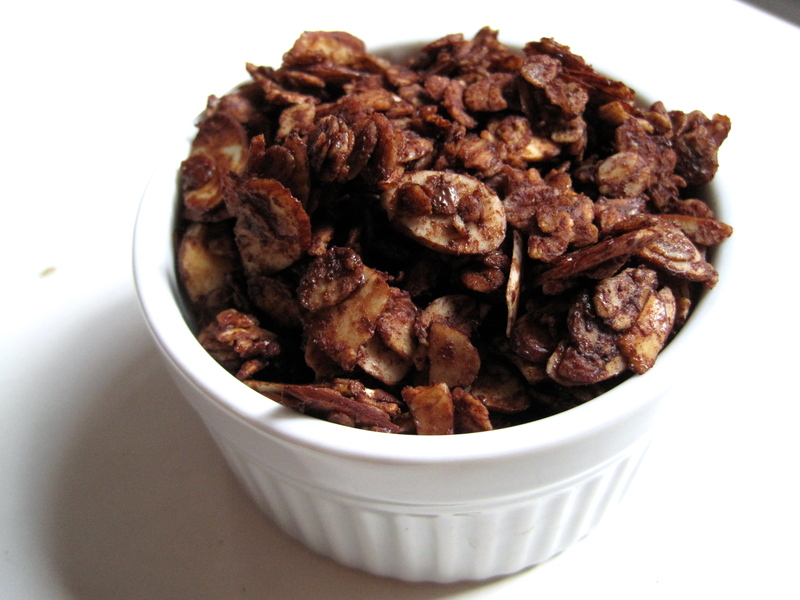 Enter my riff on Trader Joe’s chocolate almond granola. My version contains old-fashioned oats, almond slivers, cocoa powder, honey, and canola oil, and chocolate shavings. The only item that I cannot procure easily that’s within the Trader Joe’s version is barley malt syrup – but that’s okay. Honey does a decent job of gluing it all together. Aside from the taste of honey, this is a pretty close replica in terms of taste. However, I still have to figure out how to replicate granola that will actually clump together. That remains an untested challenge. I suspect a lower temperature and quick-cooking oats will help with the agglutination. Preheat oven to 300 degrees F. Line a baking sheet with greased parchment paper or a silicone sheet. In a large mixing bowl, stir together oats, almonds, and salt. Mix honey and oil in a small bowl and whisk in cocoa powder until smooth. Stir in vanilla extract. Pour over dry ingredients and toss to coat. 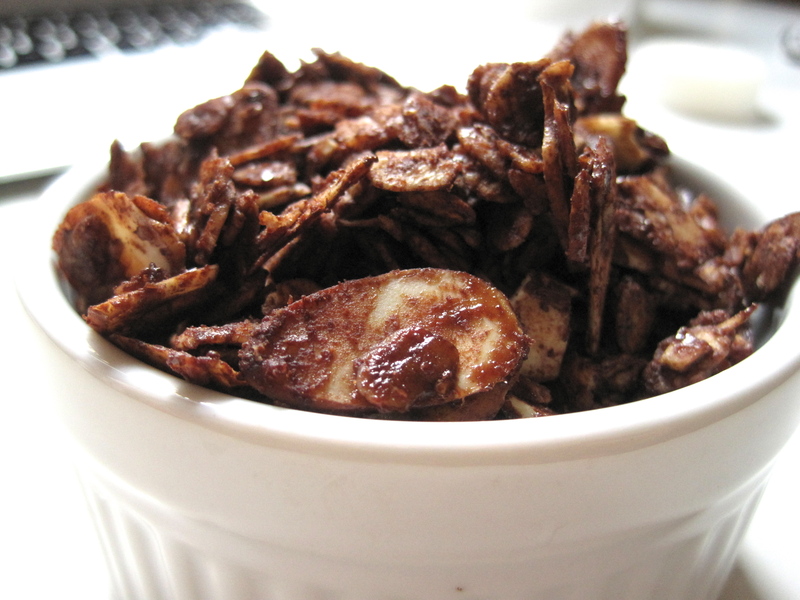 Spread granola onto prepared baking sheet in an even layer. Bake until granola is no longer sticky, about 30 to 35 minutes. Let cool. 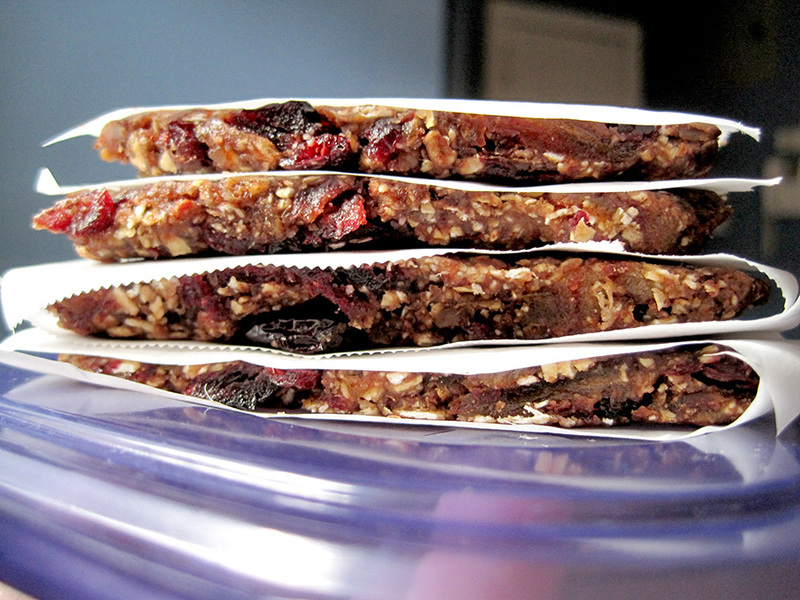 When granola is just barely warm, grate a chocolate bar over the granola. 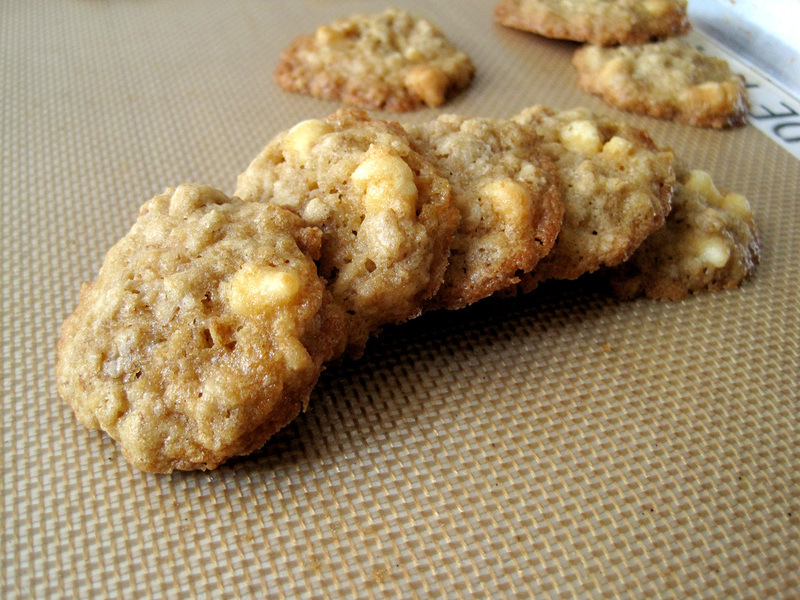 This may look like a nondescript oatmeal white chocolate chip cookie. But little did you know that when you bite into it, there would be unexpected warmth and spice from the candied ginger chunks that cuts the sweetness of the white chocolate a little bit. What I like best about these cookies is how it is reminiscent of the winter holidays. The flavors are definitely very seasonal, and somehow the combination of oats, ginger, white chocolate and honey just feel like a warm, comforting embrace. Which explains why I have eaten so many. Nom nom noms. Preheat to 375°F. Line 2 large baking sheets with parchment paper. 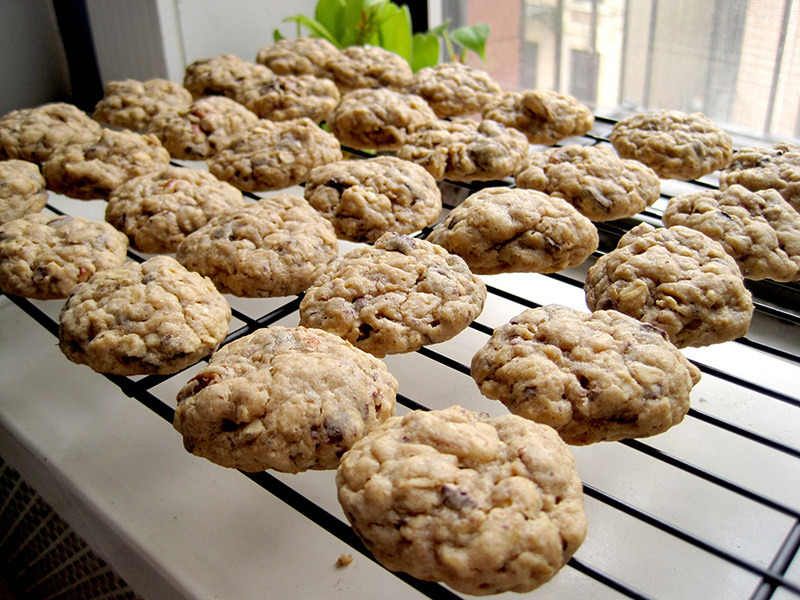 In medium bowl, combine oats, all-purpose flour, whole-wheat flour, salt, and baking soda. Set aside. Using electric mixer at high speed, beat butter and brown sugar until fluffy, 2 to 3 minutes. Add egg, honey, and vanilla and beat until smooth, about 1 minute. Add oat mixture and mix at low speed just until incorporated. Stir in white chocolate chocolate and ginger. Refrigerate dough for 30 minutes or until slightly stiffer. In the interest of time optimization, I recommend doing the dishes now. 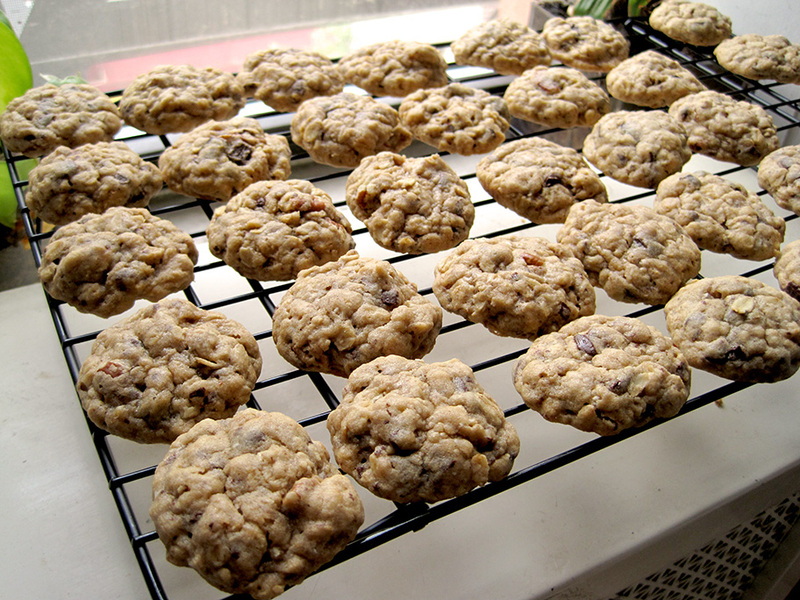 Drop rounded tablespoons of dough about 2 inches apart onto baking sheets. Bake until golden and slightly crisp on edges, about 14 to 16 minutes. Cool on sheets 3 minutes, then transfer to racks to cool completely.